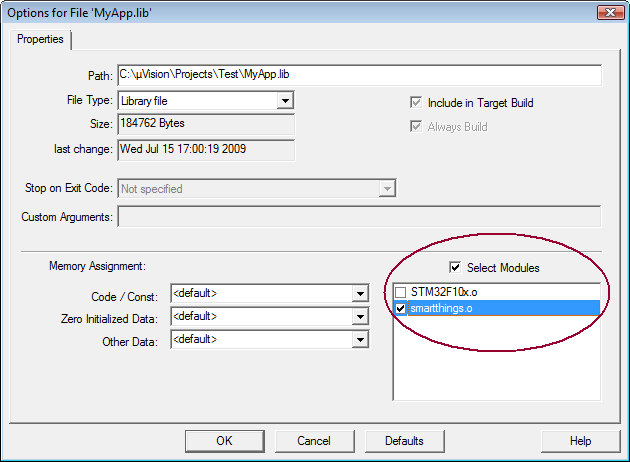 Library Modules that should be included always in a project can be specified in the item's Properties dialog. This can be useful, for instance, when generating a boot portion of an application containing generic routines that are used from program parts which are reloaded later. Add the library that contains the needed object modules to the project. Open the dialog Options for File library name.LIB. Set Select Modules, and enable the object modules needed for the application. Object module names that include space characters are not supported by the linker and result in a linker error if selected.